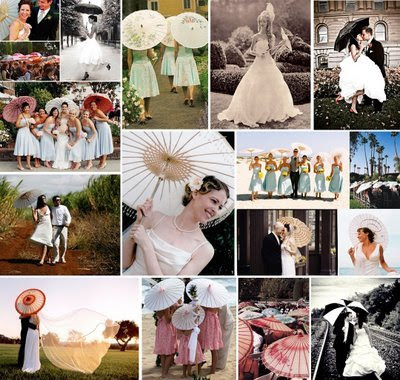 Parasols make a unique addition to a wedding, especially an outdoor one. They might be a budget-friendly alternative to bridesmaid bouquets, as well. 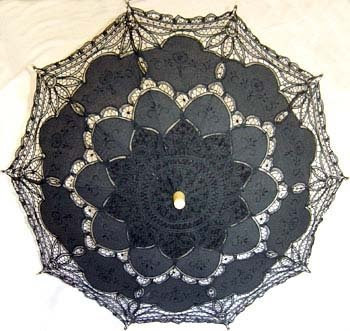 My Mamaw gave me the one and only parasol I've ever owned when I was about 8 years old. It was purple with lots of frills, and I adored it right down to the purple plastic handle. I especially adored it as the perfect accessory to my big, flouncy peach pageant dress which I convinced my mom to let me wear to Easter services at church. I didn't care if peach and purple clashed, I was on a mission to be the biggest walking collection of ruffles and organza at First Presbyterian Church. I think I succeeded. My poor parents. Knowing Philip's family, I think I can safely say they were at church that day, too. How Philip resisted me in my peach drowning pool, I cannot say. But I can assure you I wanted him to notice me because that was back at the height of my childhood crush on him, right before I decided grey sweatpants were dorky and that any boy that wouldn't chase me on the playground was a stupidhead. Hopefully on this most special of upcoming occasions, he'll notice me for all the right reasons. And I will try to rein in the flounce a bit. But just a little bit. Image collage via All Things Lovely.